Do leaked transcripts and 'secret documents' raise the specter of an 'Israeli Edward Snowden'? A forthcoming book on the Middle East peace process claims Israel wiretapped phone calls between former US President Bill Clinton and the late Syrian dictator Hafez al-Assad during peace talks 15 years ago, according to Newsweek. The book, entitled "Cursed Victory: A History of Israel and the Occupied Territories", cites as proof what it says are verbatim quotes from transcripts of the conversations between the two. Its author, Ahron Bregman, says the transcripts were provided to him by "private sources". Bregman, an Israeli-born political scientist and lecturer on Middle East affairs now based in London, claims to also have transcripts of conversations during 1999 peace talks between Clinton and former Israeli PM Ehud Barak, as well as a letter written by former Secretary of State Madeline Albright to Barak's predecessor (and current PM) Binyamin Netanyahu, in which she promises not to suggest a deal to the Palestinian Authority before checking that it was acceptable to Israel. "Recognizing the desirability of avoiding putting forward proposals that Israel would consider unsatisfactory, the U.S. will conduct a thorough consultation process with Israel in advance with respect to any ideas the U.S. may wish to offer to the parties for their consideration," the book claims Albright wrote to Netanyahu on Nov. 24, 1998. "This would be particularly true with respect to security issues or territorial issues related to security," she added. 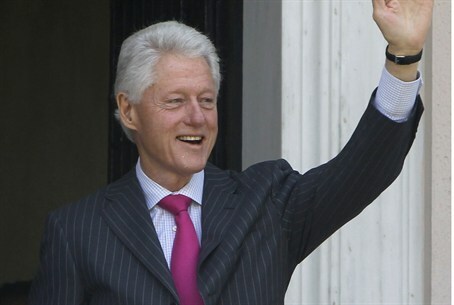 Both Israeli and American officials - including Albright herself and sources close to former President Clinton - declined to comment on the claims. Few Israelis are likely to be surprised by the revelations that the government kept a close eye on developments between the US and Israel's arch Syrian foes. Neither will they be surprised by what the classified documents over 1999 talks reveal - that the US played a key role in coaxing the two sides to the negotiating table. Of greater concern will be the fact that transcripts of what was recorded were somehow leaked to a London-based academic along with classified documents, raising the prospect of what the Newsweek reports termed "an Israeli Edward Snowden" - referring to the rogue US spy who leaked classified documents about American spying tactics. "The fact that Bregman managed to get ahold of wiretap transcripts, the holy grail of intelligence, whether they were obtained by Israel or the United States or any other intelligence power, proves that Edward Snowden is not alone," warned Yediot Aharonot senior military and intelligence affairs correspondent Ronen Bergman.